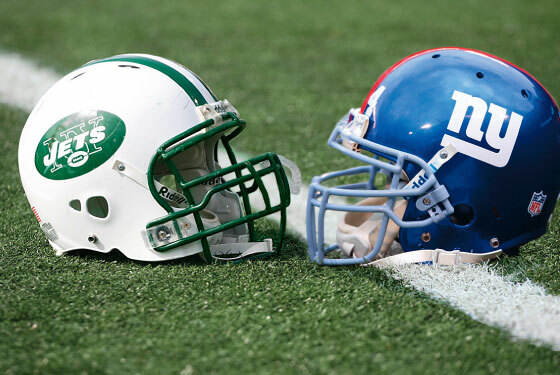 Who Will Go Further: Jets or Giants? Area Manager, USA Sport Group. At the end of Week 4 it's interesting to see the state of New York football! Although both New York teams are 2-2, both teams have a long way to go if they want to make the playoffs. The Giants again lost to the Eagles this weekend; when Andy Reid tried to ice the kicker on a missed field goal attempt it offered Tynes an opportunity of redemption. However, Tynes' second kick fell short to give the Eagles the victory. Tynes would not have been kicking from 54 yards if the Giants had showed more composure instead of Barden being called for offensive pass interference on the last drive. After 4 games, a 2-2 record it is not the end of the world for the Giants, however suffering defeats to Philadelphia and Dallas could prove crucial at the end of the season. But it could have been worse; you could have watched the Jets on Sunday. The 49ers showed that they need to be considered as legitimate Super Bowl contenders, and Rex Ryan spoke the truth with his post match reaction, I will save young ears and not repeat the words he used. Nothing worked for the Jets this weekend and with so much uncertainty all over the field it is difficult to see how the Jets will be able to reach the playoffs. The defense looked poor at best and struggled against the run, and with Revis out for the season it is difficult to see how they are going to shut down teams as Kyle Wilson clearly looked out of depth. The scoreboard could have been even worse for the defense if David Akers hadn’t missed two field goal attempts. However, the offense looked terrible and nothing went their way; Sanchez struggled to throw for 100 yards with an interception and a fumble, and when running the ball they struggled to gain yards, turning the ball over all too often. So far the Jets' two wins have come against Buffalo and Miami, neither team are genuine playoff contenders and the Jets need to sort themselves out quickly if they want to reach the playoffs. There is still a long way to go in the season and after four games it should not be time to panic, unless you are New Orleans fan. With the season slowly starting to develop though you can see who the playoff contenders are, and neither New York team is at the head of their class! The Jets have the harder conference to negotiate, and with so many strong defenses to play, the first thing the Jets have to figure out is there offense. Is it too early to look at changing the quarter back? No, but it is not the right decision to bring Tebow in yet. At the end of the day, Tebow is in the league as a quarter back and surely the Jets signed him as a quarterback? So at some point play him at quarter back, rather than every other position on the field. Even with all of Tebow’s faults, he gets the job done and wins games! I feel for Sanchez as there are so many problems all over the field, nevertheless if he has many more games like the one on Sunday, Ryan will have no choice but to drop him. Again, it looks like it could be another disappointing season for the Jets if it continues as it has started! Are the Giants even the best team in their Conference? It is questionable, but losing to the Cowboys and Eagles straight away puts the Giants up against it. The Giants seem to be starting in a similar way to last season, however if Philadelphia continue as they have started and winning close games, the Giants cannot allow to give them a head start. On the bright side, the Giants seem to have several rookies who are looking good with Wilson being the stand out star this weekend. Who will go further? If the Jets and Giants continue as they have started, neither team will be in playoff contention come the end of the season. Unless the Jets sort themselves out it is difficult to see how they will be involved in the post season and I hope that Tebow will come in and turn the team around as he did in Denver! The Giants should be in the Post season, but it looks like Giants are relying too heavily on Manning’s miracles. The problem with this is the rest of the teams around them have improved and the Giants seem to have stayed the same! It's still early in the season but it's not looking good at the minute for either New York team, which is unfortunate being a fan of both teams. I remain optimistic that one of the teams will be able to pull something out the bag, with something special from Manning, or will it soon be 'Tebow time'? At the minute, praying for a miracle from a quarter back is what it has come down to otherwise I’m afraid to say that I think New York could be without a team in the post season.